Greeting’s from Greece! 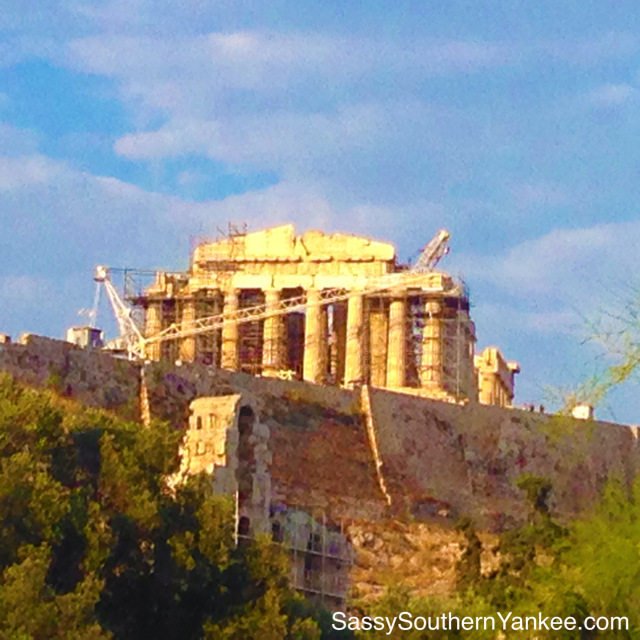 I have been in Greece for the last week doing a bit of foodie research and sight seeing, so please forgive the lack of postings. I should have amazing pictures and wonderful food to share with you in the coming weeks! Here is something that I whipped up before I left for my grand adventure. Ever have one of those days where you’re in the mood for fall, but its the beginning of summer? Have no fear! I love my fall foods too, and I’m not ashamed to make them in the summer! Yumkin Pumpkin cake is the perfect treat anytime of the year. I made this just a few days before my trip to Greece and it was a hit! Not only is Yumkin Pumpkin cake a delicious addition to your anytime recipe book, but its super easy to make too! Preheat the oven to 350* and grease a 8×8 or 9×9 square pan. Make the box cake according to package directions or you can use my measurements for eggs and oil that are listed above. 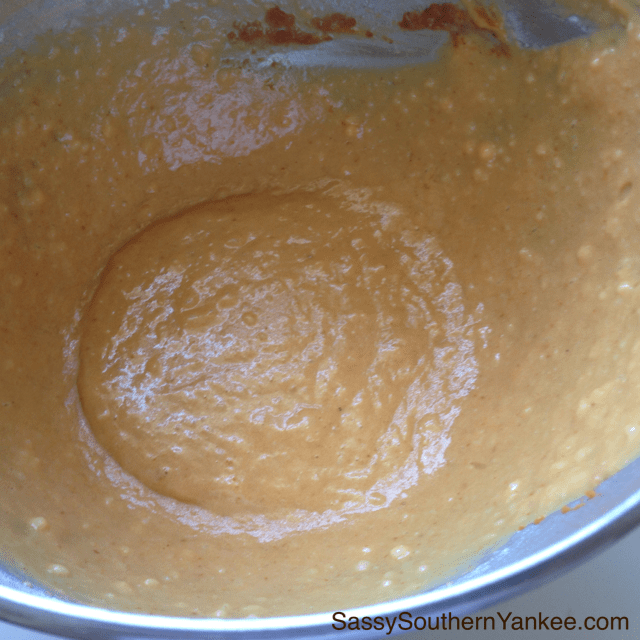 Add half of the pumpkin puree, and 1 teaspoon of the pumpkin pie filling to the cake batter. In another small bowl take the remaining pumpkin puree, remaining pumpkin pie spice and 1/2 Cup of the brown sugar and combine until mixed through. Pour half of the cake batter into the greased 8×8 pan. Next pour the pumpkin puree mixture over the first layer smoothing with a spatula to cover the first layer evenly. Pour the remaining cake batter over the pumpkin puree layer smoothing with a spatula to cover the second layer evenly. Sprinkle the top with the chopped pecans and remaining 1/2 Cup of brown sugar. If you want you can also sprinkle with a bit more of the pumpkin pie spice. Bake in the oven for about 25-35 min depending on your oven. This simple yumkin pumpkin cake is sure to be a hit at any even regardless of the season. Enjoy and I look forward to sharing my recipes from Greece in the coming weeks. Antio sas! Ever have one of those days where you're in the mood for fall, but its the beginning of summer? Have not fear I love my fall foods too, and I'm not ashamed to make them in the summer! Yumkin Pumpkin cake is the perfect treat anytime of the year. I made this just a few days before my trip to Greece and it was a hit! Not only is Yumkin Pumpkin cake a delicious addition to your anytime recipe book, but its super easy to make too! Preheat the oven to 350* and grease a 8x8 or 9x9 square pan. Make the box cake according to package directions or you can use my measurements for eggs and oil that are listed above. 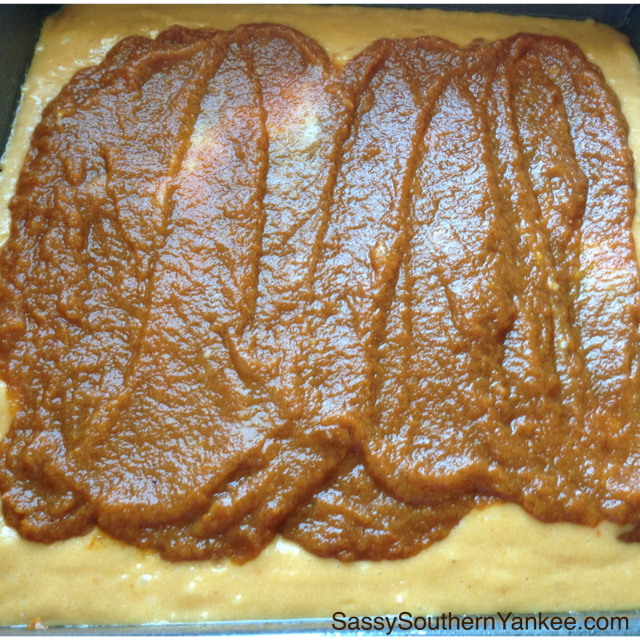 Add half of the pumpkin puree and 1 teaspoon of the pumpkin pie filling to the cake batter. In another small bowl take the remaining pumpkin puree, remaining pumpkin pie spice and ½ Cup of the brown sugar and combine until mixed through. Pour half of the cake batter into the greased 8x8 pan. Next pour the pumpkin puree mixture over the first layer smoothing with a spatula to cover the first layer evenly. Pour the remaining cake batter over the pumpkin puree layer smoothing with a spatula to cover the second layer evenly. 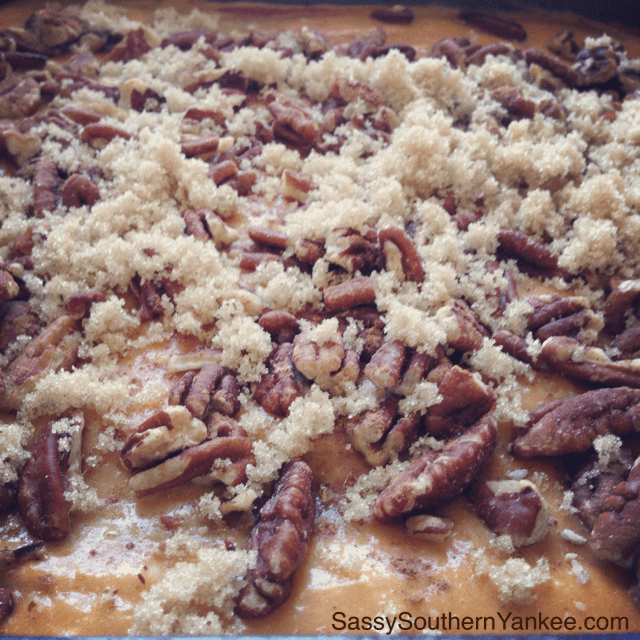 Sprinkle the top with the chipped pecans and remaining ½ Cup of brown sugar. If you want you can also sprinkle with a bit more of the pumpkin pie spice. Bake in the oven for about 25-35 min depending on your oven. 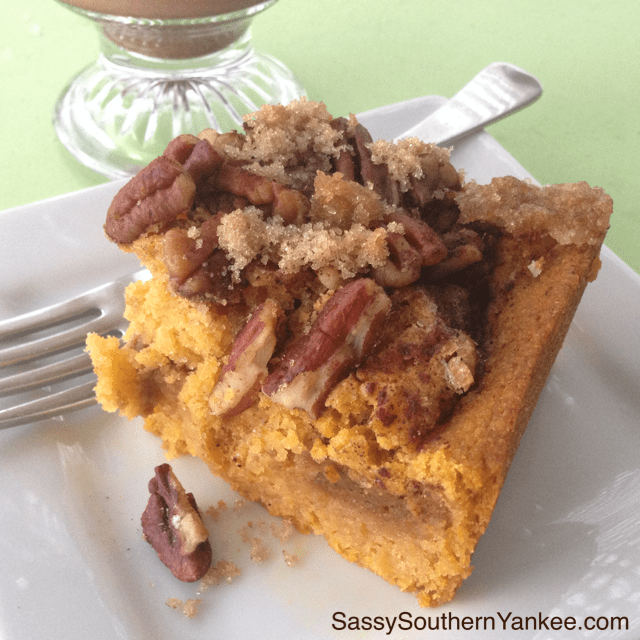 This entry was posted in Dessert and tagged Cake, Crumb top, Easy Desserts, Fall Cakes, Gluten Free, Gluten Free Cakes, Halloween Cake, Pecans, Pumpkin, Pumpkin Cake, Pumpkin Spice.